For much of the offseason, the Yankees were said to be looking for another starting pitcher despite having five starters for five rotation spots. They were connected to potential impact guys too. Gerrit Cole, Michael Fulmer, Chris Archer … pitchers like that. The Yankees are apparently willing to trade quality prospects to get one of those guys, but so far a trade has not come together. One might before Opening Day, but it hasn’t yet. Sonny Gray: Three DL stints in the last two years (trap, forearm, lat). Jordan Montgomery: Career high workload in 2017. CC Sabathia: Pitching on a degenerative right knee. Luis Severino: Career high workload (by far) in 2017. Masahiro Tanaka: Good for one or two short DL stints each year, plus The Elbow™. Every single team in baseball has physical concerns in their rotation. Every single one. The Yankees, I think it’s fair to say, have more than most. They have some nice depth pieces slated to begin the season in Triple-A in Luis Cessa, Domingo German, and Chance Adams. The depth can always be better though. There’s always room for another starter. To that end, I am here to do what the headline says, and that is make a case for re-signing Jaime Garcia. Is Garcia an impact pitcher like Cole or Fulmer or Archer? Nope! But he is a capable big league starter who would give the Yankees that extra layer of rotation depth. After all, the Yankees traded for Garcia for that exact reason last year. For rotation depth and to guard against physical concerns, most notably Montgomery’s workload. Garcia, 31, had a 4.82 ERA (4.87 FIP) in eight starts and 37.1 innings with the Yankees last year, though those numbers are skewed a bit by terrible first (six runs in 4.2 innings) and last (five runs in 2.1 innings) starts. Between those two starts Garcia had a 2.97 ERA in 30.1 innings. He had 4.41 ERA (4.25 FIP) in 157 total innings last year. I see three reasons the Yankees should consider re-signing Garcia. An average-ish strikeout rate and a comfortably above-average ground ball rate. Only five left-handed starters have at least an 18.0% strikeout rate and a 50.0% ground ball rate over the last three seasons: Dallas Keuchel, Patrick Corbin, Francisco Liriano, Alex Wood, and Jaime Garcia. Liriano is the cautionary tale. He’s been pretty terrible the last two years (5.05 ERA and 4.80 FIP) despite those strikeout and ground ball numbers. The point is lefties who can miss bats and get grounders are not easy to find, and Garcia can do both. Those are welcome traits in Yankee Stadium. Including with the Yankees! Garcia came out of the bullpen in Game One of the ALDS last year and threw 2.2 scoreless and hitless innings, which gave the offense a chance to get back in the game. The bats never did come around, but that wasn’t Jaime’s fault. Garcia worked out of the bullpen very early in his career and more recently with the Cardinals in 2016. He doesn’t have a ton of experience in that role, but he does have some, and that ALDS Game One performance last season showed he can do it. Garcia can come out of the bullpen and be effective. Given the bullpen talking point, I should note Garcia’s numbers against left-handed batters are good rather than great — they’ve hit .248/.296/.379 (.293 wOBA) with a 23.0% strikeout rate and a 57.3% ground ball rate against him the last three years — so if the backup plan is using him as a true left-on-left reliever, it might not work so well. Garcia can pitch out of the bullpen though. He can be stashed there until a need arises in the rotation. The market has not been kind to free agents this offseason. Many of the top guys are having trouble finding jobs. Second and third tier free agents like Garcia have been completely left out in the cold. Spring Training started this week and I’m sure a bunch of those guys are getting pretty nervous right now. They’re not just wondering where they’ll play this season, but if they’ll play at all. Garcia was not expected to receive a large contract going into the offseason anyway — MLB Trade Rumors had him at two years and $16M — and now, given the market, he could be headed for a low base salary one-year contract. The Rangers gave Doug Fister one year and $4M. Miguel Gonzalez got one year and $4.75M. Mike Fiers got one year and $6M. Can Garcia get more than that? Maybe! But I wouldn’t bet on it at this point. The Yankees have about $12M to spend even after setting aside $10M for midseason additions. The financial aspect of re-signing Garcia should be no problem. The Yankees have the payroll space. It’s just a question of what the Yankees are planning to do with that $12M — are they eyeing an infielder? — and is Garcia willing to come back to New York and their hitter friendly ballpark to be sixth on the rotation depth chart, and possibly sit in the bullpen all year? If nothing else, re-signing Jaime won’t break the bank or endanger the luxury tax plan. Cheap depth. For what it’s worth, Garcia’s projections aren’t good — ZiPS has him at 4.71 ERA (4.66 FIP) in 2018 — though I’m not going to sweat that. I’m not talking about throwing him into the rotation all season. Sign him to a cheap one-year deal, stick him in the open final bullpen spot, and if injury or poor performance creates a need in the rotation, then Garcia can slot in. If not, no big deal. And given the expected contract terms, It’d also be an easy move to back out of if Garcia stinks. Just cut him. The Yankees insist they are comfortable with their rotation and are willing to go into the season with this group, and hey, so am I. They’re not foolish enough to think they’ll make it through the season with only five (or even six) starters, however. The Yankees have been looking for another arm, and since landing a true impact guy seems unlikely at this point, spending a little cash on a cheap left-handed depth arm with a penchant for ground balls strikes me as a nifty little pickup that could pay dividends. In 2016, the Yankees sold at the trade deadline, signaling time for a rebuild. A year later? The tables had turned with the Yankees as buyers looking to bolster a club already in playoff contention. Through two big deals and a few smaller ones, Brian Cashman was able to give the Bombers an extra boost they needed for the stretch run, October and beyond. In one move, the Yankees solved multiple problems. Need another corner infielder in case Greg Bird doesn’t come back? There’s Frazier. Need to bolster the bullpen that’s gotten slightly overused? Robertson and Kahnle. It was a perfect move. It did cost the Yankees, but not irreparably. They had to deal Rutherford just a year after drafting him in the first round. While he has plenty of potential, he’s yet to show any power. Clarkin and Polo likely wouldn’t have been protected in the Rule 5 draft, so they were expendable (Clarkin was added to the White Sox’ 40-man, Polo was not after getting hurt in the Arizona Fall League). And somehow Tyler Clippard got himself traded to the Astros and won a World Series ring. Go figure. We’ve already written about Frazier, D-Rob and Kahnle‘s respective impact in our season review series, but each has potential impact beyond this season. Robertson is under contract for 2018 while Kahnle won’t be a free agent until 2021. That’s a lot of value, even if the Yankees don’t re-sign the ToddFather. As far as 2017, they each filled their roles to a tee. Frazier fixed the Yankees’ last hole in the lineup and brought energy to the club (Thumbs Down!). Robertson and Kahnle were studs down the stretch and in the postseason. Garcia represented a fill-in for the Yankees’ rotation, an extra arm to allow Jordan Montgomery to throw fewer innings in the second half. As a rental, there was no expectation of him sticking around and it’s not like the Yankees expected him to start in the postseason. He ultimately gave the Yanks 37 1/3 kinda-sorta average innings over eight forgettable starts before throwing 2 2/3 innings in ALDS Game 1. Remember that outing? He wasn’t bad, walking two and striking out three while absorbing eight outs. Enns made two appearances for the Twins, allowing four runs (three earned) on seven hits over four innings. He was probably getting DFA’d or outrighted in the offseason, so he was highly expendable. Littell less so. The 22-year-old righty acquired for James Pazos had a remarkable year between High-A and Double-A in 2017. Between the Yankees’ and Twins’ organizations, he threw 157 innings, struck out 142 and had a 2.12 ERA while going 19-1. He is a new member of the Twins’ 40-man roster. He may not have made the Yankees’ roster this offseason, but he could be someone the Yanks regret dealing. This deal made all the sense in the world. Getting 2.5 years of Gray for three prospects, two of whom were injured and one likely blocked. Who knows if Kaprielian can stay healthy at this point? He has the stuff to pitch in the majors if he ever does stay on the mound, but that’s seeming less and less likely. Fowler had a pretty bad knee injury and the Yankees had Clint Frazier, not to mention Gardner, Judge, Hicks and Ellsbury in the majors (and now Giancarlo!). Mateo seemed to have broken out after reaching Double A Trenton, but he was blocked by plenty of outfielders, just like Fowler. So the Yankees dealt from a position of strength and added Gray, who had two playoff starts after a solid end to the season. He had some homer issues, but he’s still a good middle-of-the-rotation starter for the Yankees and much more affordable than similar arms on the current free-agent market. Even with the strong potential of all three players given up, it’s a deal the Yankees should make every time. – While the Yankees picked up bonus money in the Gray deal, they also dealt two possible Rule 5 picks for extra money in July. They dealt RHPs Matt Wotherspoon and Yefry Ramirez to the Orioles for a lot of Baltimore’s pool as the O’s don’t really wade into the international market. Considering the fact that Shohei Ohtani is now a Los Angeles Angel, these moves didn’t quite work out. The Yankees can still use some of the pool on other prospects, including the few remaining ex-Braves, but they couldn’t reel in the big fish of the international market and are left holding a little too much bonus money. Oh well. – In exchange for Rob Refsnyder, the Yanks acquired Double A first baseman Ryan McBroom in mid-July. Refsnyder had been DFA’d and McBroom was a non-prospect. He did fill a hole as depth after the team had run through multiple first basemen in the majors. McBroom had previously hit some homers against the Trenton Thunder, so it was good to get him out of the opposing dugout. – Along the same lines as the McBroom deal, the Yankees dealt LHP Tyler Webb for Garrett Cooper. Cooper filled in for Chris Carter/Greg Bird for a month or so before going down with injuries. Webb gave up a grand slam on literally his first pitch with the Brewers. Seriously! – Lastly, at the waiver deadline, the Yankees acquired Erik Kratz from the Cleveland Indians to be their depth catcher. He had two hits in two at-bats, produced 0.1 WAR and mostly rode the bench before being outrighted off the roster this offseason. For next year, the Yankees still have Gray, Kahnle and Robertson as well as, to a lesser extent, McBroom and the bonus pool money. McBroom is hitting over .400 in Mexico right now! But at the 2017 deadline, Cashman acquired a starter and two late-inning relievers for 2018. He has plenty of prospects left if he wants to add further at next season’s deadline. As for the prospects traded away, it’ll be nice to see what Fowler can do in the majors this year. The rest of the prospects dealt are either further away from the show or are unlikely to even reach the majors in 2018. Regardless, monitoring their development from afar will be a pleasant side gig for Yankees fans. Although they went into Spring Training with two open rotation spots and physical concerns with the other three spots, the Yankees made it through the 2017 season using only eleven different starting pitchers. Only ten teams used fewer. Furthermore, the Yankees had only eight pitchers make at least five starts this year. Those eight pitchers accounted for 158 of the Yankees’ 162 starts this season. Pitching depth is a necessity in baseball, not a luxury, and the Yankees got some decent production out of their depth arms this year. Given how often pitchers get hurt, the performance of your sixth or seventh starter can very easily be the difference between a postseason berth and a long offseason. Times to review the three starters who drew the most fill-in starts during the 2017 season. It wasn’t until mid-June that the Yankees were forced to use a sixth starter for the first time. A hamstring injury sent CC Sabathia to the disabled list, and while Cessa’s overall Triple-A numbers weren’t great (4.15 ERA and 4.40 FIP in 65 innings), he’d allowed only five runs in his previous three starts and 20 innings. He was the hot hand. Plus he lined up perfectly with Sabathia’s rotation spot. Cessa made three starts while Sabathia was sidelined, during which he allowed eleven runs on 13 hits and six walks in 13.2 innings. One start was okay (three runs in five innings) while the other two were bad (four runs in four innings, four runs in 4.2 innings). Joe Girardi kept the leash short with Cessa — he averaged only 82 pitches in those three starts, all Yankees losses — which was understandable. The Yankees kept Cessa around as a long reliever following Sabathia’s return, and he pitched fairly well in that role, allowing six runs in 14.2 innings across five appearances. One real disaster outing against the Reds (three runs in one inning) skew the numbers a bit. Cessa tossed 4.2 scoreless innings against the Blue Jays on July 4th and 3.1 scoreless innings against the Rays on July 30th. Following a quick stint in Triple-A, Cessa returned to the Yankees in mid-August, making a spot start against the Mets on August 14th when Sabathia’s knee acted up. He allowed two runs in 4.2 innings and had to be pulled after throwing 66 pitches with what appeared to be a back injury. Cessa would not pitch again this season. He was placed on the disabled list the next day with what the Yankees called a rib cage injury. It was season-ending. In five spot starts this season Cessa pitched to a 5.82 ERA (6.25 FIP) and held hitters to a .256/.360/.535 batting line in 21.2 innings. In five relief appearances, he had a 3.14 ERA (4.83 FIP) and a .259/.333/.389 opponent’s batting line in 14.1 innings. (Cessa also had a 3.46 ERA and 3.86 FIP in 78.1 Triple-A innings.) Pretty bad all around, save those long relief outings against the Blue Jays and Rays. The swing-and-miss rate on Cessa’s slider this year: 21.4%. The MLB average is 16.9%. The whiffs-per-swing rate on Cessa’s slider this year: 43.2%. The MLB average is 35.2%. When you’re getting empty swings like that on your slider, why bother messing around with a curveball and changeup, especially when you’re trying to stick around and establish yourself in the big leagues? Cessa will turn 26 in April and he has a minor league option remaining for next season, so he figures to again be an up-and-down depth arm in 2018. He doesn’t want to become Bryan Mitchell. That good arm/bad results guy who runs out of options without having carved out a role in the big leagues. Depending how the rotation depth chart shakes out, the Yankees might be best served by putting Cessa in the bullpen full-time next year, and letting him air it out with an upper-90s fastball and a swing-and-miss slider. He just might surprise you. Despite strong overall results, the rotation was enough of a concern at the trade deadline that the Yankees added two starters, not one. Michael Pineda went down with Tommy John surgery, Luis Severino and Jordan Montgomery were piling up innings, and Sabathia’s knee is an ongoing concern. So, on July 30th, the Yankees traded pitching prospects Dietrich Enns and Zack Littell to the Twins for veteran southpaw Jaime Garcia. They then traded for Sonny Gray the next day. 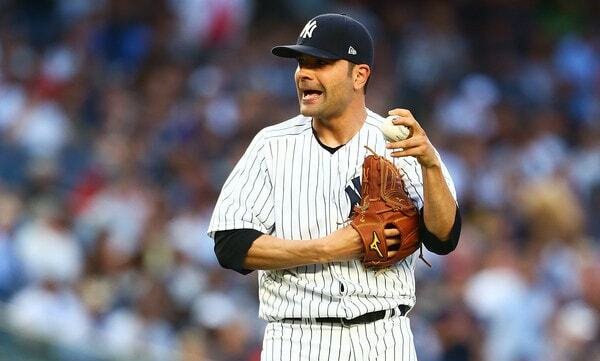 Garcia made his Yankees debut on August 4th and it did not go well. Not at all. He allowed six runs (five earned) in 4.2 innings in Cleveland. Yuck. After that though, Jaime reeled off a six-start stretch in which he pitched to a 2.97 ERA (4.67 FIP) in 30.1 innings. Girardi had a short leash and didn’t let Garcia face the middle of the lineup a third time often, but hey, that’s a serviceable six-start stretch. Coincidentally enough, Jaime’s best game as a Yankee came against the Twins, his former team, on September 18th. Nine strikeouts and one unearned run on four hits and one walk in 5.2 innings against the team chasing you for the top wildcard spot. Could you imagine if Garcia had pitched like that in a postseason race against the Yankees after they’d traded him? Good gravy. The hot takes would burn down the internet. Garcia helped the Yankees sweep the Twins that series, which effectively ended the race for the top wildcard spot. Garcia was a rental. He’s a free agent now and there are no indications the Yankees may bring him back, though, to be fair, there are no indications the Yankees plan to do anything right now. Things have been pretty quiet the last few days. I suppose the Yankees could look at Jaime as a one-year candidate should they opt against bringing Sabathia back. I doubt it, but you never know. Smith’s season started with the biggest opportunity of his career. He was in camp with the Cubs as a Rule 5 Draft pick. Chicago wanted him so much they worked out a trade with the Brewers to get him. In a prearranged deal, Milwaukee picked Smith in the Rule 5 Draft, then immediately traded him to their NL Central rivals for an undisclosed sum of cash. The Cubbies wanted Smith, but they had the last Rule 5 Draft pick and were worried he wouldn’t last, so they made the trade. Things didn’t work out for Smith with the Cubs. He allowed three runs (all on solo homers) in 6.1 Cactus League innings and was returned to the Yankees at the end of camp. It was going to be tough for Smith to crack Chicago’s roster given their depth anyway, and once he started serving up dingers in Spring Training, that was that. The Cubs took a look, didn’t like what they saw enough to keep him, then sent him back to the Yankees. The Yankees had Smith start the season back in Double-A — he spent the 2015 and 2016 seasons with Trenton — but moved him up to Triple-A Scranton a week into the season. He was lights out with the RailRiders. I’m talking 2.11 ERA (3.32 FIP) with 25.6% strikeouts in 15 starts and 89.2 innings before getting his first MLB call-up in July. The Yankees needed another long man and Smith was their pick. Despite being a lefty with good velocity — Smith’s fastball averaged 93.6 mph and topped out at 97.1 mph during his brief MLB stint — and a good changeup, Smith struggled to put hitters away in his two spot starts, especially once the lineup turned over. Realistically, I don’t think there was anything he could do in those two starts to convince the Yankees they didn’t need Garcia and/or Gray. That he struggled made the decision to make the trades that much easier. Smith went back to Triple-A for a few weeks after that before returning in mid-August as a reliever. In six relief outings to close out the season, he allowed eight runs in 8.2 innings, with opponents hitting .265/.359/.559 against him. A disastrous three runs, no outs appearance against the Rangers on September 8th skews his numbers a bit for sure. But still, Smith did not pitch all that well in the show. He threw 18.2 total innings with a 7.71 ERA (5.62 FIP). Two weeks ago, as part of their annual 40-man roster cleanup, the Yankees traded Smith (and Garrett Cooper) to the Marlins for pitching prospect Mike King and $250,000 in Shohei Ohtani international bonus money. Smith wasn’t going to survive the 40-man roster purge and the Yankees got what they could for him. This is a good thing for him. Smith will turn 27 in July, and he figures to have a much better big league opportunity with Miami next year than he would with the Yankees. Hopefully things work out for him. He’s stuck with it for an awful long time in the minors. Although the Yankees are still mathematically alive in the AL East race, odds are they will go to the postseason as a wildcard team, and odds are they will host the Twins at Yankee Stadium. The Yankees have already punched their postseason ticket. Once the Red Sox clinch the AL East and the Twins clinch the second wildcard spot, everything will be set. The Wild Card Game is, technically, its own postseason round. Teams set their 25-man Wild Card Game roster, then can make adjustments prior to the LDS. That leads to some unique roster construction. Why carry four or five starting pitchers for one game, for example? I’m a bit surprised MLB didn’t try eliminate that Wild Card Game roster rule. Or maybe they did try and were unsuccessful. Whatever. Anyway, the Yankees carried 16 position players and nine pitchers on the 2015 Wild Card Game roster. For real. Like I said, there are better ways to use those last few roster spots than carrying extra starting pitchers. The Yankees are not guaranteed to follow the 16 position players and nine pitchers blueprint again, but it does give us an idea what to expect in advance of the Wild Card Game next Tuesday. So, with that Wild Card Game now six days away, I figured this would be a good time to try to piece together the 25-man roster the Yankees could use for that winner-take-all affair. Really stinks the Yankees are going to win 90-ish games then have to play in that Wild Card Game, huh? Oh well. Can’t do anything about it. Let’s take a look at the potential Wild Card Game roster. This is the easiest group, so we might as well start here. These are the 18 players we all know will be on the Wild Card Game roster as long as they’re healthy. Pretty straightforward, right? Right. I’m as annoyed by Dellin’s walks as much as anyone, but they’re not leaving him off the Wild Card Game roster in favor of … Chasen Shreve? Jonathan Holder? Ben Heller? Gio Gallegos? Another starter? Yeah, no. These 18 dudes will be on the Wild Card Game roster. Aaron Hicks (oblique) returned last night and Adam Warren (back) is expected back soon. At one point earlier this season it seemed Hicks would start the Wild Card Game, maybe even hit first or second, but not anymore. The injury and Jacoby Ellsbury’s late season resurgence put an end to that. He’ll be on the Wild Card Game roster as the fourth outfielder though, as long as he’s healthy. Warren will of course be on the roster as well. Again, as long as he’s healthy. Health is the only reason these two wouldn’t be on the Wild Card Game roster. They’re on, so add them to the locks and that’s already 20 players. Like I said, the Yankees carried only nine pitchers on the 2015 Wild Card Game roster. That’s typical. It’s one game, not a series, so there’s no need to carry all five starters. The Yankees figure to carry the scheduled starter (duh), a backup starter in case the scheduled starter is unable to go for whatever reason (hurt during warmups, sick before the game, etc. ), and an extra starter should things go crazy in extra innings. Three starters seems like the right amount to me. Severino is on track to start the Wild Card Game with one extra day of rest. That’s the easy part. Who backs him up? That will depend as much on the pitching schedule as anything. Whoever starts the final regular season game Sunday won’t be on the Wild Card Game roster Tuesday, for example. Right now, Sonny Gray lines up to pitch the day of the Wild Card Game on normal rest and Jordan Montgomery is on track to pitch that day with two extra days of rest. Masahiro Tanaka and CC Sabathia, meanwhile, would be on short rest that day. Because of the schedule, Gray and Montgomery seem like the obvious candidates to be the backup starters behind Severino. I suppose Jaime Garcia could be in the mix given how he dominated the Twins last week, though I think that’s unlikely. The Yankees could always call an audible and change the rotation this week, but that would surprise me. They’ll have their best ready to go in Severino. Assuming Warren is healthy, Severino plus Gray and Montgomery gets the Yankees to nine pitchers and 22 players on the roster overall. The 12 locks plus a hopefully healthy Hicks gets the Yankees to 13 position players, leaving three open spots should the Yankees again go the 16 position players plus nine pitchers route. Realistically, there are five candidates for those three roster spots: Miguel Andujar, Tyler Austin, Clint Frazier, Erik Kratz, and Tyler Wade. Garrett Cooper didn’t even get a September call-up, so I he’s not a postseason roster candidate. Ditto Kyle Higashioka. I think Austin is on the postseason roster for sure. He’d give Joe Girardi a right-handed power bat on bench and, just as importantly, a backup first baseman should Bird (or Headley) get lifted for a pinch-runner. You don’t want to give up the DH or have to play Holliday at first base in the Wild Card Game. Austin’s righty power and ability to play first base (and right field in a pinch) seems pretty clearly worth a Wild Card Game roster spot in my opinion. Easy call. Wade, even though he basically never plays, strikes me as someone who has a leg up on a Wild Card Game roster spot as well. He’d give the Yankees coverage all around the infield and can play left field in a pinch as well. Also, he can run. Crazy fast. Maybe the Yankees don’t consider him a designated pinch-runner option — they didn’t acquire that player this September — but still, the situation could present itself, and Wade is the closest thing the Yankees have to a true burner available. I think he’s on the roster as the 24th or 25th player. Frazier’s roster fate could be tied to Hicks. If Hicks re-injures the oblique or simply can’t get going these next few days, Frazier would be the obvious candidate to serve as the fourth outfielder in the Wild Card Game. I love Frazier, but I’m really hoping Hicksie is on that Wild Card Game roster. He’s such a weapon when right. The Yankees could always carry Hicks and Frazier, in which case Frazier’s role would be extra righty bat, fifth outfielder, and potential pinch-runner. Frazier is low key fast as hell. That could come in handy at some point during a close game. The Yankees don’t trust Andujar’s defense at third base right now — they’ve made that clear given how little he’s played there so far — and he can’t play any other positions, so he doesn’t have much to offer in the Wild Card Game. He’d be an extra righty bat and emergency third baseman. That’s it. Kratz? Don’t be surprised if he’s on the roster. The Yankees carried three catchers in the 2015 Wild Card Game — Sanchez, who had two September at-bats in 2015, was on the Wild Card Game roster that year — and they could do so again, just for an emergency. You know we’re in for at least one Wild Card Game roster surprise, right? Right. Austin and Wade are more utility players than true outfielders, but I stuck them in the outfield section for easy table building purposes. The Twins are going to start a right-hander no matter what in the Wild Card Game — the only lefty in their rotation is up-and-down depth guy Adalberto Mejia, and he sure as heck isn’t starting that game — so I imagine Bird will be in the starting lineup and Holliday will not. Holliday has been pretty terrible against righties lately. The Yankees, of course, don’t want to use their 25-man roster in the Wild Card Game. They’d like to stick with their nine starting position players and three, maybe four pitchers, tops. That would be the ideal Wild Card Game scenario. The rules say you have to carry a 25-man roster though, and you knows, maybe those 23rd and 24th and 25th players on the roster end up being a factor. No one plans for it to happen that way, but baseball can be weird sometimes. Instead of building on the positive momentum from their sweep of the Twins early in the week, the Yankees opened their weekend series in Toronto with a mistake-filled blowout loss, 8-1, to the Blue Jays. This road trip north of the border has been a nightmare for the Bombers in recent years. Following Friday’s defeat, they guaranteed themselves yet another season-series loss in Canada. The last time the Yankees had a winning record at the Rogers Centre was 2009. 35 homers allowed are tied with Phil Hughes (2012) for the second-most in Yankees history, behind Ralph Terry’s 40 in 1962. Oh, how times have changed: Terry was an All-Star, started 39 games, threw 298 2/3 innings and even got a few MVP votes that season, while Tanaka is at 29 starts and 177 1/3 innings. Five games with three or more homers allowed leads MLB this season, and is tied with Catfish Hunter (1977) for the most in a season in Yankees history. Five games with at least seven earned runs matches the most in a season by any Yankee pitcher, a mark he shares with A.J. Burnett (2010) and Red Ruffing (1934). Remember, folks, Tanaka had never given up more than six earned runs in any of his 75 career starts entering this year. The final pitch he threw was a hanging 0-2 slider with the bases loaded in the sixth inning, that Ryan Goins drilled into the seats in right-center. It was the second grand slam he’s surrendered this year, and – you guessed it – he had never given one up prior to 2017. Even worse is the fact that Goins was 0-for-22 against Tanaka entering that at-bat, and had never even hit a flyball or line drive in his career against him! Finally, there’s this stat that sums up Tanaka’s Jekyll-and-Hyde 2017 campaign: Through Friday, he was the only pitcher in MLB this season that had five games with at least three homers allowed. He was also the only pitcher in the majors that had thrown multiple games with at least 13 strikeouts and no walks. Aaron Judge was a one-man offensive machine, producing the team’s only run and two of their three hits. His 469-foot booming shot into the second deck in the first inning was the longest homer at the Rogers Centre this season, and tied for his second-longest of the season. Through Friday, he was the only player in baseball to hit three homers of 469-plus feet this year. It’s official. The Yankees punched their ticket to the postseason party with a comeback win, 5-1, on Saturday afternoon. It was fitting that the clinching victory came in a game where the Yankees had to rally, after the Blue Jays took a 1-0 lead in the third inning. This was the Yankees 34th win when their opponent scored first, tied for the most in the majors through Saturday. Sonny Gray tossed six strong innings and limited Toronto to one run on four hits, as he continued his six-week stretch of gutty performances on the road. It was his ninth road start in a row with two earned runs or fewer allowed, the longest streak among AL pitchers this season. Greg Bird earned the hero’s cape when he golfed a 91-mph cutter into the right-field seats in the fifth inning, putting the Yankees ahead 3-1. Bird is no stranger to delivering big hits: eight of his 17 career homers have given the Yankees the lead. Among Yankees with at least 10 home runs since Bird’s debut in 2015, his “go-ahead homer percentage” of 47.1% is the second-best, trailing only … Jacoby Ellsbury (47.8%)! We’ll also give Bird our Obscure Yankeemetric of the Series: This was the second time he’s hit a clutch homer on the road against the Blue Jays; the only other Yankee first basemen with multiple go-ahead homers in Toronto are Jason Giambi and Don Mattingly. Less than 24 hours after a rousing playoff-clinching victory, the Yankees played like they were still hung over from the late-night celebration. Not only did they lose the rubber game of the series, but the loss also gave them a disappointing 40-41 record on the road this season as they head home for the final week of games. This is the second year in a row they’ve been below .500 away from the Bronx, the first time in more than two decades they’ve done that. The last time it happened came during the dark ages, a seven-season stretch of road mediocrity from 1987-93. Jaime Garcia put the Yankees in an early hole, giving up a home run to Teoscar Hernandez on the second pitch he threw. It was the 10th lead-off bomb the Yankees have surrendered this season, the most they’ve ever allowed in a single season in franchise history. Garcia remains winless in eight starts as a Yankee, tied for the second-longest such streak by any pitcher to begin his pinstriped career over the last 100 seasons. The only longer streak belongs to Steve Trout, who failed to get a win in his first nine starts after a mid-season trade in 1987. To say that Garcia lacked command would be an understatement. Not only did he throw a wild pitch and walk three of the 14 batters he faced, but more than half (33 of 60) of his pitches were called balls. His strike percentage of 45 percent is the lowest by any Yankee starter that threw 60-plus pitches in an outing since at least 2000 (as far back as we have complete pitch-by-pitch data). The only Yankee right-handed batter to hit more longballs in a season is A-Rod, who hit 54 during his 2007 MVP campaign. The 48 homers are the third-most by a Yankee in his age-25 season or younger, trailing Babe Ruth (54 in 1920) and Mickey Mantle (52 in 1956). At the age of 25 years and 151 days, he is the second-youngest Yankee to reach six multi-homer games in a season, behind a 24-year-old Mickey Mantle in 1956. He now has 11 homers in September, the third time this season he’s hit double-digit longballs in a calendar month. The last Yankee to match that feat was Roger Maris in 1961, who had four months with at least 10 homers during his record-setting 61-homer campaign. Over the weekend the Yankees shuffled their rotation under the guise of keeping CC Sabathia and his balky right knee off the turf in Toronto this coming weekend, and I’m sure there’s some truth to that. Sabathia aggravated the knee and had to go on the disabled list the last time he pitched at Rogers Centre. The last thing the Yankees want this late in the season is an injured pitcher. The rotation shuffle does two things. One, it keeps Sabathia away from the turf in Toronto. And two, it means Luis Severino will not start this week against the Twins, the team closest to the Yankees in the wildcard race. No player on the Twins has ever faced Severino (seriously), so Minnesota would be going into the Wild Card Game blind, should they and the Yankees qualify. Reading scouting reports and watching video only helps so much. There’s no substitute for standing in the box. I would bet against Garcia making that start in the makeup game against the Royals next Monday. Thursday’s off-day allows the Yankees to start everyone on extra rest next week anyway, and, more importantly, skipping Garcia lines Severino up to pitch the Wild Card Game with an extra day of rest. And it’s not just about the extra rest. That extra day is also an insurance policy in case there’s a rainout or something. If the Yankees do skip Garcia next Monday, the Game 162 start could go to Domingo German or Bryan Mitchell, assuming the game is meaningless. If it’s a must-win situation, you run Tanaka out there on normal rest. Anyway, the Yankees were originally going to skip Garcia this turn through the rotation, which would’ve allowed them to start their three best pitchers against the Twins this week. They were ready in case the wildcard race was closer than it is and this series really meant something. Instead, the Yankees increased their lead over the Twins the last few days, so this series isn’t as important as it looked a week ago. It’s important! But the race isn’t as close as it was, and it gives the Yankees some flexibility. “We’re planning on Tanaka for Wednesday, but I could change my mind,” said Girardi yesterday, hedging a bit and indicating Severino could indeed start against the Twins this week. I suppose that depends how tonight and tomorrow go, but, worst case scenario, the Yankees will be one game up on the Twins for the first wildcard spot and 3.5 games up on Angels the for a wildcard spot in general come Thursday morning. Right now the Twins are the team the Yankees are mostly likely to face in the Wild Card Game — for all intents and purposes it’s down to the Twins and Angels because everyone else has fallen further back — so hiding Severino makes sense. Let them go into the Wild Card Game blind. At the same time, if things go wrong the next two days, the Yankees can still run Severino out there Wednesday to stop the bleeding. They have some flexibility. Shuffling the rotation this week is as much as about Severino as it is Sabathia’s knee. He was already lined up to start the Wild Card Game, or at least close enough to being lined up that the Yankees could’ve made it happen at pretty much any point. Now the Yankees have a chance to make sure the Twins don’t see Severino before the Wild Card Game while still having the ability to throw him at Minnesota this week, if necessary. It was a small little move that could potentially yield big dividends.